Say hello to an excellent and useful product to make your life much easier. It is also a modern product for home chefs who want to unseal their semi-prepared ingredients fast and easy. This is a must-have product for any kitchen. A simple and small, yet very helpful bottle and jar opener set. If you want a modern equipped kitchen and you want to make your cooking experience delightful, it's time to get this set because it is reliable, easy to handle, comfortable and very easy to store. Opening jars, bottles or cans won't be a problem anymore with our brand new jar lid opener kit. Unseal food covers, open pickles jars and tuna cans in just a bit. Instead of making several purchases focus on making just one. A great one. Why should you get your own package? A perfect package created especially for the elderly, arthritis and weak-hand sufferers. LET'S MAKE OUR ELDERLY'S LIFE EASIER. Most of the time our seniors need help, but we can't be there for them every time. This arthritis bottle opener could be a great and helping gift for our seniors especially for the ones suffering of arthritis. This way, they can open any type of bottle, jar or can, effortlessly. Imagine how confident and independent they must feel using our premium kitchen gadgets set. OPEN ANY JAR, ANY BOTTLE, ANY TIME. The bottle cap opener set includes 3 objects made of durable anti-skid soft materials suitable for opening any kind of jar or bottle. Multiple functions lead to opening jars or bottle with less effort. Place the can lid opener onto the lid, twist and easily open the seals without any slippin. ALL IN ONE JAR & BOTTLE OPENER KIT FOR SENIORS. The 5 in 1 jar opener comes with 5 functions so anyone can open any kind of bottle, can or jar. It is suitable for loosening jar lids which makes it a great opener set for seniors. This will help you the most for the vacuum sealed jars. This cool little kitchen gadget set of jar and bottle openers for arthritis hands will make life easier for everyone you love. OUR PACKAGE CAN BE THE PERFECT GIFT FOR ALL AGES. If you're Mom, Grandma, Grandpa, elderly relative or friends struggle with opening bottles and jars, this arthritis grippers set is the perfect gift for them. And don't worry, you are backed with our satisfaction guarantee (if they don't like the gift for any reason, you can e-mail us and we will give you 100% money back and they can keep the jar and bottle opener for weak hands set for themselves). WHAT'S IN THE PACKAGE: The glass jar opener for elderly set comes with 3 products, but one of it it's a 5in1 product and the others are a 2in1 product. The multifunction jar, can, and bottle opener has 5 functions being able to open and loosen almost any kind of bottle or lid. The "duck" opener has 2 functions being able to open any kind of bottle cap and almost any jar lid. The silicone rubber gripper pad's functions are one for gripping jars and one for opening jar lids up to 5 inches wide. Manufacturer: Kitchen Gadgets Int. Co. Publisher: Kitchen Gadgets Int. Co. Studio: Kitchen Gadgets Int. Co. 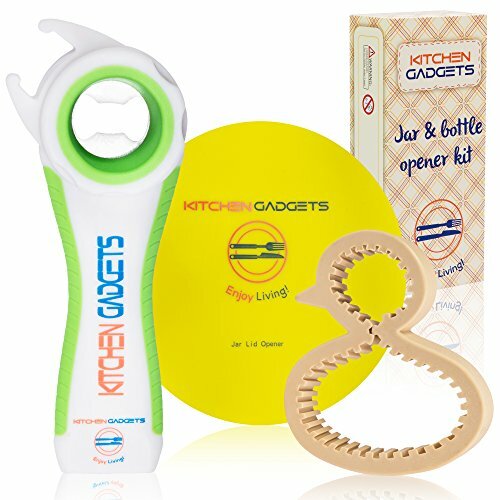 If you have any questions about this product by KitchenGadgets, contact us by completing and submitting the form below. If you are looking for a specif part number, please include it with your message.